Some years ago, I read a very funny book called Eat this Book: A Year of Gorging and Glory on the Competitive Eating Circuit. It was hilarious. So when Kathleen found out that there was going to be an IFOCE-sanctioned eating contest right here in Little Tokyo in downtown Los Angeles, I knew we had to go see it. The contest was gyoza eating. The time was 10 minutes. The record was somewhere over 200. So this promised to be quite a spectacle. When we got there, the announcer was stirring up the crowd and getting everyone ready for the main event. There were two tables. One for amateurs, and one for the professional eaters. One seat at the amateur table had been reserved to be auctioned off for charity, and the winner paid $60 to sit in it. They had a big parade and introduction of the pros. All were ranked in the top 50 in competitive eating. Like professional wrestlers, they all made their own distinctive entrances, and each had a theme song. 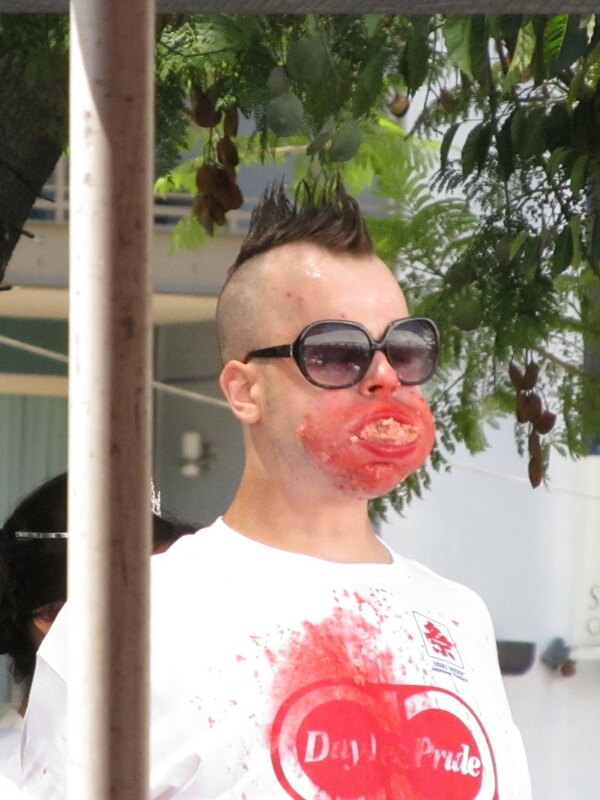 The eating hadn’t even started, and this was already a tremendously entertaining spectacle. Then it was time for the contest. The announcer counted down, and the eating commenced. And it was epic. I’d figured out that they would have to average something like one gyoza every 2.5 seconds to even have a chance at winning. But I really had no idea what that would look like. But I saw that that translated into the gurgitators stuffing many gyoza into their mouths at once. The chewed a little bit and then washed it all down with a little bit of water or whatever was their drink of choice. One thing that I think would have made this better would have been a large clock to count down the time. The announcer counted down, first by minutes, and then by seconds the last minute, but I think that having a large clock would have really helped the drama. In any event, he counted down the last 10 seconds and called time. 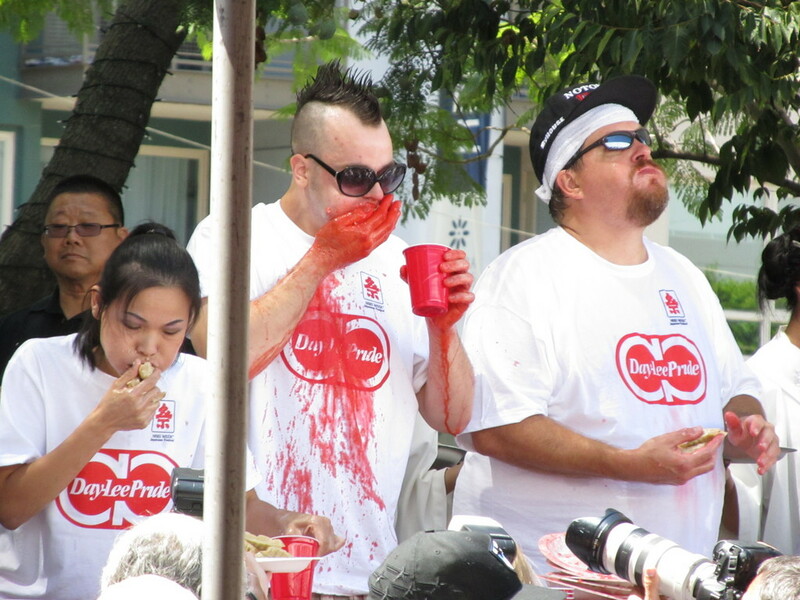 Apparently, the rules allow for the contestants to stuff as much food as they want into their mouths before time is called. As long as they swallow it, it’s all all right. So the final seconds had all the contestants stuffing massive numbers of gyoza into their mouths, and they ended up looking like demented chipmunks with their bulging cheeks. Along the way, only one contestant suffered a ‘reversal of fortune‘, and that was the guy who had won the charity auction for the final seat at the amateur table. Well, regardless, he had a unique experience. When it was all over, they tallied the results, and the winner had eaten 264 gyosa. 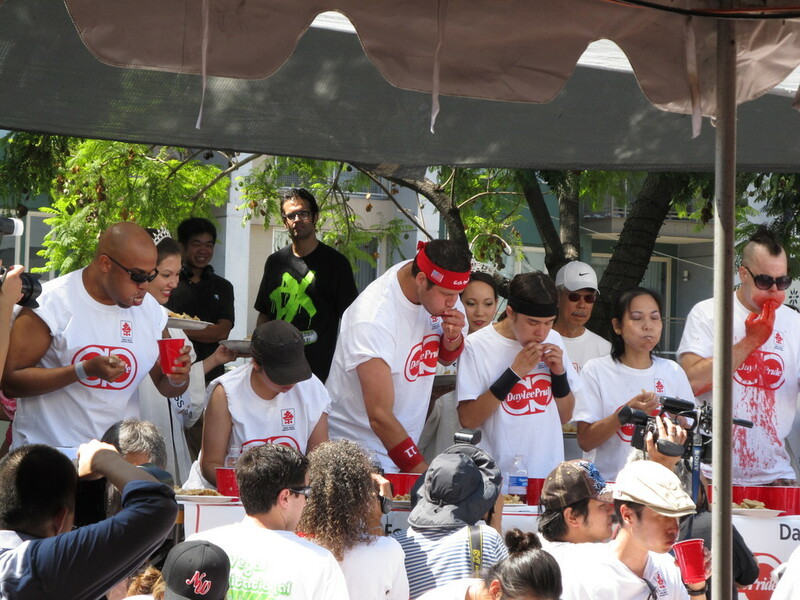 That works out to an average of one gyoza every 2.36 seconds for the 10 minutes of the contest. Just the thought of that makes me queasy. At last, I’ve found a sport that’s even more insane than the one I like to compete in. It was a fun little outing.